Important tips to prepare this porridge: Soaked the rice 2 hours prior to cooking, this way you will save the cooking time as well as energy. 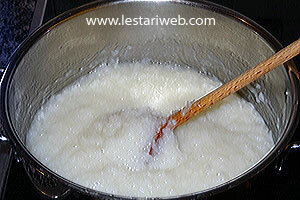 1Making Rice Porridge: Put the rice in a bowl with enough water. Soak for abour 2 hours. Wash & drain. 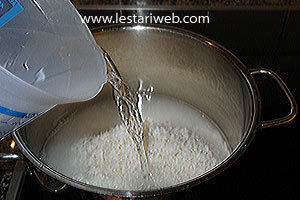 2Transfer the rice into the saucepan, add 1 liter cold water and salt. 3Cook on medium heat and bring to boil. Continue to cook until the rice getting soft and becomes thicken. Stirring occasionally. 4Adjust the taste. If necessary add the salt. Remove from heat. 5a Making the Chicken Soup: Boil 1.5 liter water in a big saucepan. *** Adjust the heat into medium. 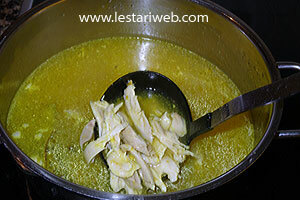 Add the chicken pieces and cook until tender. Remove from the pan and set aside and let it cool. 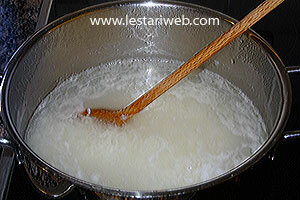 6 Remove the excessive flat from the stock, run it through kitchen sieve if nesessary to obtain clear stock. 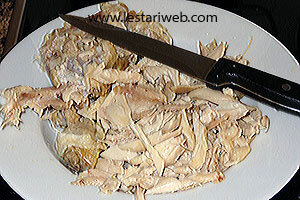 7a When the chicken is cool enough to handle, shred or slice the chicken into strips/small pieces, put back into the stock. 8 Put all ingredients for the paste in a grinder or food processor and blend until smooth. (If necessery add a little bit oil to help the blending process). 9 Heat 3 tbsp oil in a Wok or big saucepan. (Don't add oil if already added in a grinder). 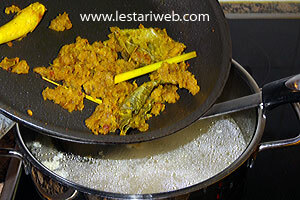 Stir fry the paste, lemon grass, kaffir-lime leaf and bay leaf. 11 Add the paste into the chicken's pan. Cook over medium heat and bring to boil. Add the lime juice. 12 Adjust the seasoning, add salt or sugar if necesary. Keep the soup piping hot on the stove. 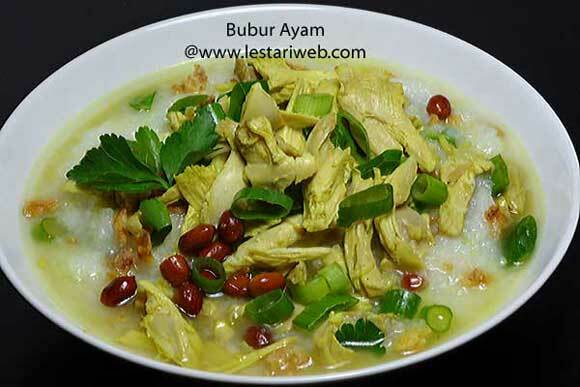 13Serving Method: Put the rice porridge on a deep plate. Laddle the chicken soup over it. 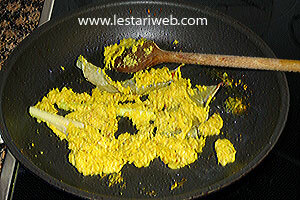 Add the slice spring onions and falt parsley on the top. Garnish with fried shallots/onions and fried peanuts. 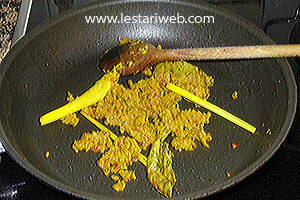 Serve sambal separately for chilli lover. 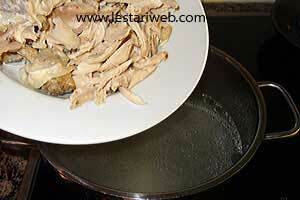 *** Add the chicken into boiled water then cook on the medium heat to preserve it's best taste. The porridge can be served cold but the soup should always be served piping hot.